ABC News visits the border with Syria as the region braces. Located in the northwest corner of Syria, along the border with neighboring Turkey, Idlib is the final stronghold of rebel fighters and jihadist extremists opposed to the Syrian regime. It's a crucial target for President Bashar al Assad. (Omar Haj Kadour/AFP/Getty Images) A Syrian woman sits on a straw mat next to children outside a tent at a camp for displaced civilians fleeing from advancing government forces near the village of Sarman in the rebel-held northwestern Idlib province, Sept. 1, 2018. In addition to opposition forces who have sworn to fight to the death, Idlib is also home to almost 3 million civilians who will be caught up in the battle. Syrian Army troops have been steadily fortifying positions along the front lines around Idlib over the past few weeks and are expected launch an all-out assault on the province in coming days. (Omar Haj Kadour/AFP/Getty Images) A member of the Syrian Civil Defence, also known as the "White Helmets", walks through the wreckage of their center which was destroyed by government forces' bombardment in the town of al-Tamana on the southern edges of the rebel-held Idlib province, Sept. 6, 2018. Eyewitnesses inside Idlib province have told ABC News that hundreds of people are already on the move as Russian air strikes have begun hitting rebel positions in recent days. 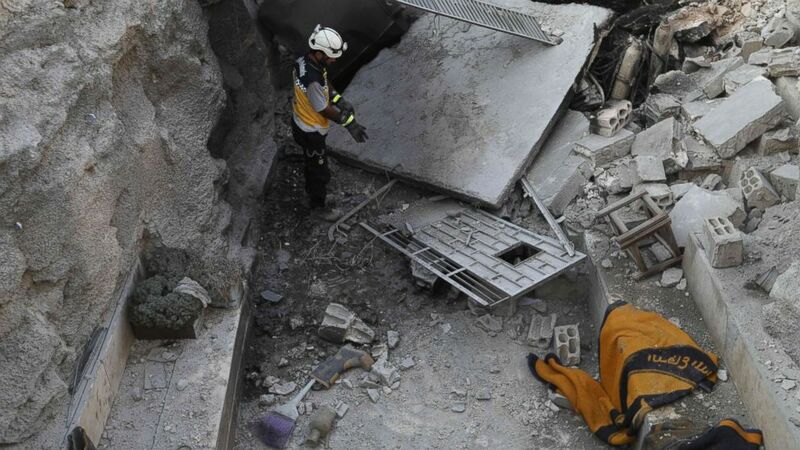 "There are no civilians left at all in the targeted villages," Hasan Younis, a member of the White Helmets emergency medical team based in southern Idlib province, said to ABC News. "They are fleeing to areas near Turkey where they hope to be safe from further aerial bombardment." Similar reports of large numbers of refugees are coming from towns and villages along the road north to the Turkish border. 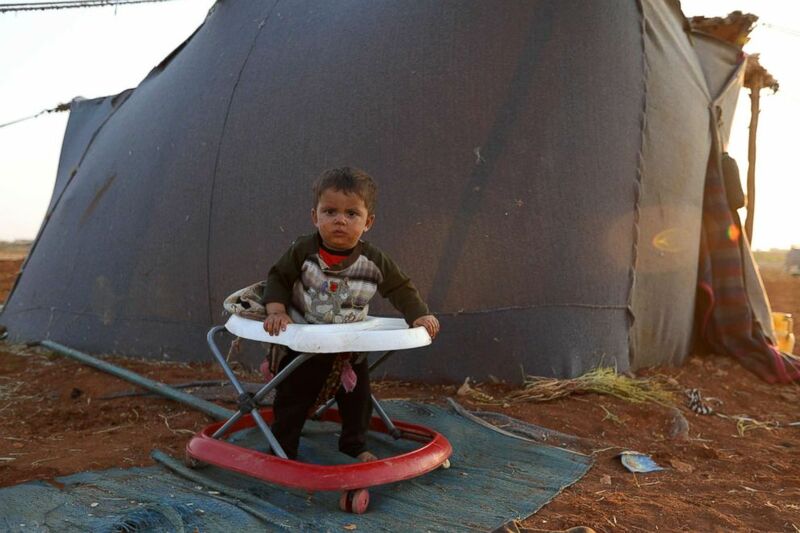 (Omar Haj Kadour/AFP/Getty Images) A Syrian infant is seen in a baby walker outside a tent at a camp for displaced civilians fleeing from advancing government forces near the village of Sarman in the rebel-held northwestern Idlib province, Sept. 1, 2018. Muafak Abu Fadef, a surgeon working in a field hospital in the Syrian town of Darkoush, told ABC News he's been treating people injured by shrapnel wounds in the air strikes. "I have seen a massive wave of civilians trying to escape north toward Turkey," he said. 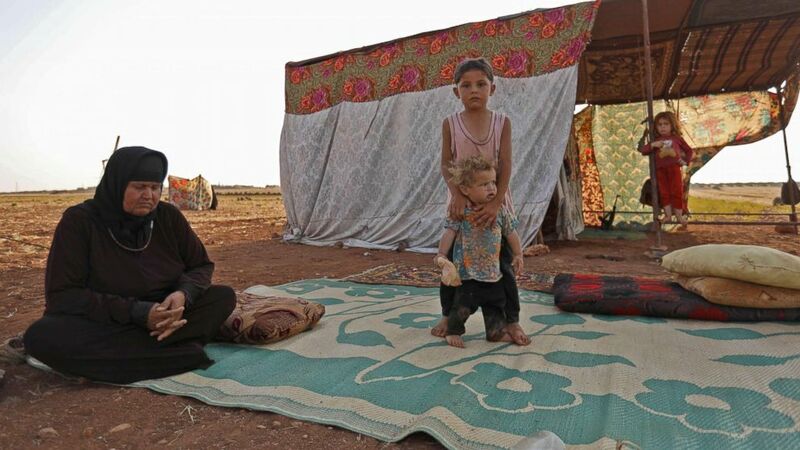 The United Nations is ringing alarm bells, predicting that an assault on Idlib would likely set in motion a refugee calamity on a scale not yet seen during the seven years of Syria's civil war. 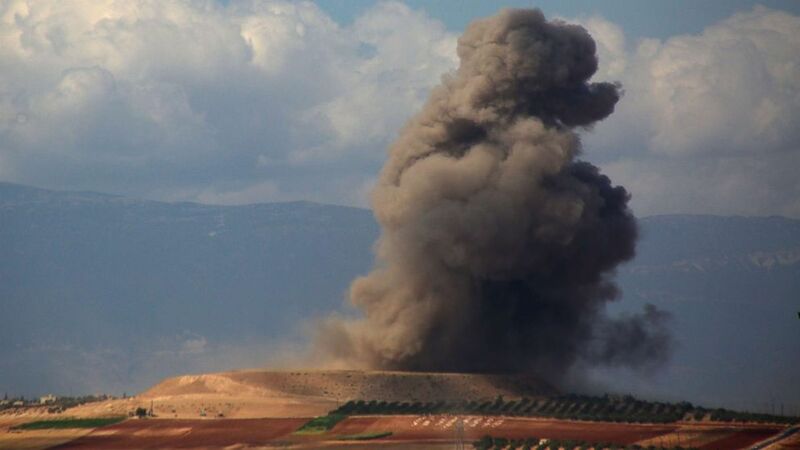 (Anas Al-Dyab/AFP/Getty Images) Smoke rises near the Syrian village of Kafr Ain in the southern countryside of Idlib province after an airstrike, Sept. 7, 2018. The White House has warned that the United States and its allies would respond "swiftly and vigorously" if Syrian government forces used chemical weapons in the widely expected offensive. "There is lots of evidence that chemical weapons are being prepared" by Syrian government forces in Idlib, the U.S. State Department's adviser for Syria, Jim Jeffrey, said in an interview with Reuters. "Any offensive is to us as objectionable as a reckless escalation."